New Delhi: The Union Cabinet chaired by Prime Minister Narendra Modi approved agreements between India and Uzbekistan for cooperation in various sectors, including tourism, pharmaceuticals and trade. A Memorandum of Understanding (MoU) was approved for cooperation in the sphere of law and justice between the two countries. The MoU takes care of concerns and requirements in the field of exchange of experience by legal professionals, government functionaries and their training and effective legal aid mechanism for resolution. The agreement is expected to facilitate greater cooperation between India and Uzbekistan in providing legal services in both countries in the field of exchange of experience through information sharing visits, and training between both countries on enhancing legal capacities of government functionaries. 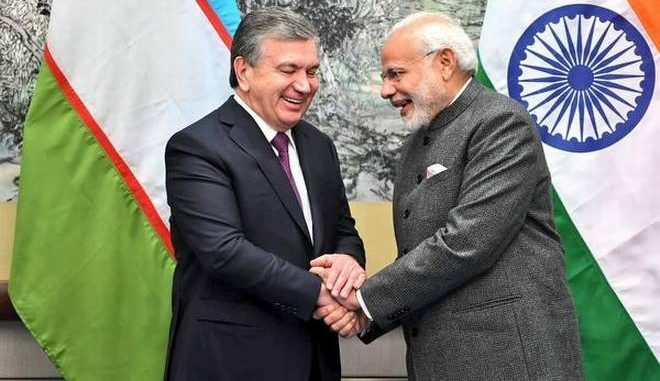 Another MoU was approved by the Cabinet for strengthening cooperation in the field of tourism, which is expected to be signed during the Uzbekistan President Shavkat Mirziyoyev’s visit to India on October 1. The signing of the MoU in the field of tourism will help the two countries in creating an institutional mechanism for enhancing cooperation in the tourism sector. It will also help in increasing foreign tourist arrivals from Uzbekistan to the country. This, in turn, will result in economic development and employment generation. The agreement shall create favourable conditions for long-term tourism cooperation for mutual benefits of all stakeholders within the broader framework and areas of cooperation. In addition, the MoU shall explore to incorporate the best practices to implement the measures that will realise the objectives set out in it. Furthermore, the Cabinet approved an MoU between the two countries for the establishment of an Uzbek-Indian Free Pharmaceutical Zone in the Andijan Region of Uzbekistan, which will also be signed during Mirziyoyev’s visit to India. The MoU will create an enabling framework of cooperation for setting up an Uzbek-Indian Free Pharmaceuticals Zone in Andijan region of Uzbekistan. It will also facilitate Indian pharmaceutical and biopharmaceutical companies to invest and establish production facilities in the Uzbek-Indian Free Pharma Zone of Andijan for manufacture of pharmaceutical products. The Cabinet also approved the signing of an MoU between India and Uzbekistan for increased cooperation in the areas of trade, industry and research and development of pharmaceutical products. In view of the importance of the growth of the pharmaceutical industry in both countries and importance of mutual cooperation in trade, production, research and development in the pharmaceutical sector, both the governments have been trying to establish a formal mechanism of bilateral cooperation. The MoU will explore the possibilities of production of medicines, including Active Pharmaceutical Ingredients (APIs) in different therapeutic segments in both countries. It will facilitate the exchange information on trade and registration procedures, legal and regulatory requirements for export and import of pharmaceuticals products, including APIs. Another MoU was approved for mutual cooperation in combating illicit trafficking in narcotics, drugs, psychotropic substances and precursors, and is expected to help in mutual cooperation in the regulation of narcotic drugs and psychotropic substances and in combating drug trafficking. It is an effective framework to deal with all issues requiring mutual assistance and cooperation in the areas identified. The Cabinet also approved the signing of an agreement between India and Uzbekistan on cooperation in health and medical science. It covers the following areas of cooperation – expanding opportunities for the development of business cooperation in the field of medical equipment, including equipment for teaching and research laboratories of institutions of medical education, and pharmaceutical products, strengthening of primary health care and setting up of healthcare facilities, medical and health research development, as well as exchange of experience in these areas, among others. A working group will be set up to further elaborate the details of cooperation and to oversee the implementation of the agreement. In the field of agriculture and allied sectors, an MoU was approved for cooperation in the exchange of information regarding laws, standards and product samples of mutual interest, establishment of joint agriculture clusters in Uzbekistan, exchange of experience in the field of crop production and their diversification, exchange of experience in the field of seed production based on modern technology, and application of technology for enhanced water use efficiency in agriculture and allied sectors, including irrigation, conduct of joint scientific research on genetics, breeding, biotechnology, plant protection and soil productivity conservation, among others. The agreement provides for the constitution of a joint working group comprising representatives from both countries, the task of which would be to prepare plans of cooperation, provide solutions to the problems arising during the implementation of the agreement and to monitor the implementation of tasks determined by the parties. The meetings of the working group shall take place at least every two years, alternately in India and in Uzbekistan. The agreement shall enter into force on the date of its signing and shall remain in force for a period of five years, being automatically extended for a subsequent period of five years. The agreement shall be terminated after six months from the date of receipt of notification of either party of its intention to terminate.